While the bathroom exists to be a functional part of the house, people have always enjoyed luxury and comfort in that space. After all, you begin and end your day in the bathroom; it’s important to feel good in that room. 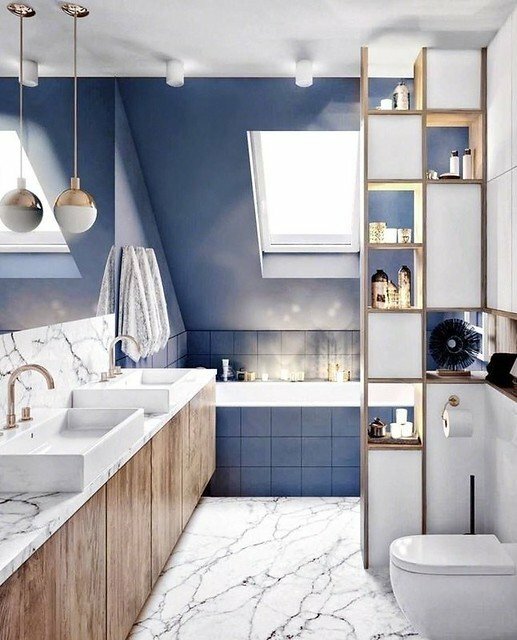 This article brings you 10 beautiful 2019 bathroom trends where technology, design, and other features come together to create both bold and subtle luxury. This is the year of comfort, pampering, and style. Let’s begin our 2019 bathroom trends with a bang. A marble interior which instantly becomes a stunning focal point with its boldness. So, whether you are using the statement-making material on walls, floors, or countertops — your bathroom is bound to be outstanding. Marble is versatile, durable, and lets you splash freely. It plays with light and brightens up space. Since it is porous, it absorbs water quickly, making it the ideal material for bathroom remodeling. If your budget doesn’t allow an all-marble decor, you can mix marble tiles of different shapes and sizes to create an intriguing pattern. Here, we combine another bathroom trend that’s huge in 2019 –fluted finishes and channeling. The rippled texture of the bathroom vanity complements the marble decor perfectly. 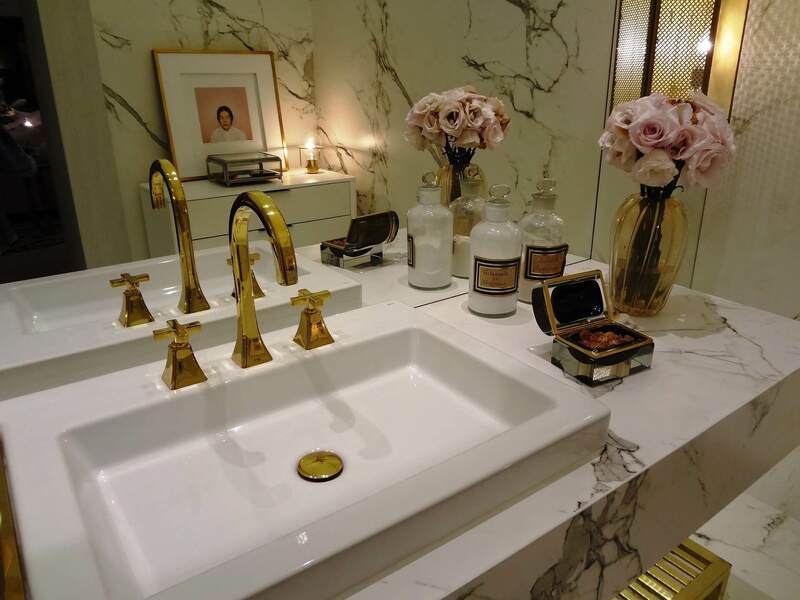 And, the gold fixtures add to the luxury element of this chic bathroom. 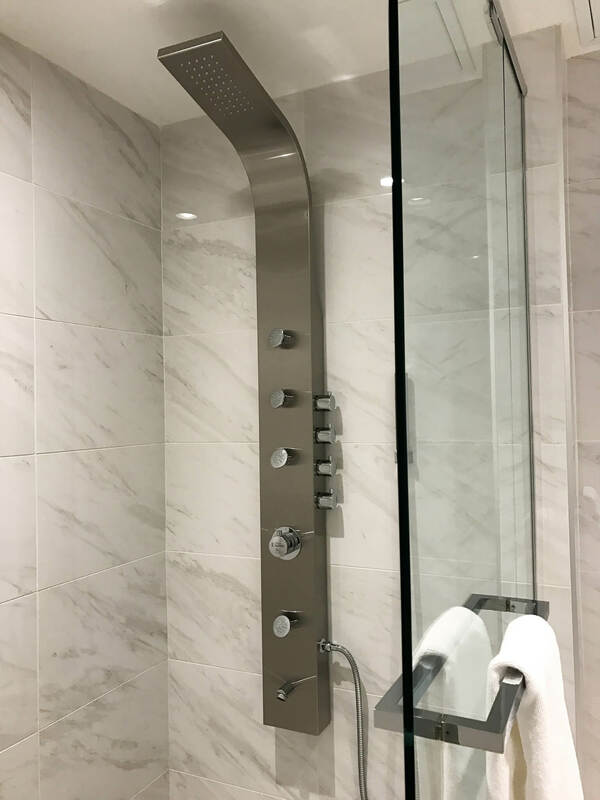 Sleek and modern looking, zero-threshold showers are perfect for 2019. They visually open up space in a bathroom by removing the threshold to the shower. This is not only a lasting, beautiful style; it’s also perfect for aging in place. Without a threshold to cause potential trips and falls, showering becomes much safer, preserving the dignity of seniors who choose to remain in their homes. An added bonus? They’re easier to clean! 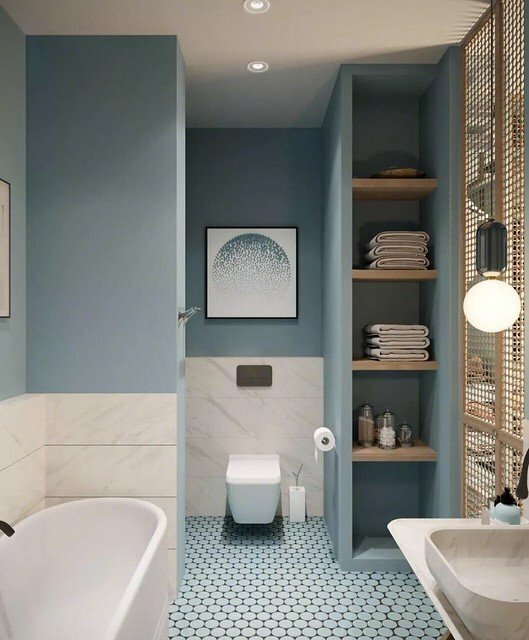 Bathroom designs of 2019 are anything but boring. A case in point — the new tile designs coming out this year. They are interesting, exciting, and fun to play with. It’s time to think beyond subway tiles. 2019 is all about texture, color, pattern, and unique design. Gorgeous mosaic tiles incorporate Mediterranean influences, three-dimensional tile makes a bold statement, and fun patterns add personality to your space. It’s 2019. It’s almost painful for any of us to be without our smartphones for more than a minute. The future is here, and bathroom design knows how to bring it home. Watch for wireless speakers, Bluetooth devices, and docking stations to be incorporated into bathroom mirrors, shower heads, and vanities. Touch mirrors can control the light at your vanity, hi-tech shower heads can remember your favorite water temperature, and even toilets get in on the hi-tech bandwagon. Be prepared for toilet seat warmers, automatic openers, slow close features, and even a music player that turns on when the lid is opened (It’s almost like magic!). The world is far more fast-paced these days, and our busy lifestyles don’t seem to leave time for long soaks in the tub anymore. Instead of deep, sunken tubs taking up a large area of the bathroom, 2019 brings deluxe showers with spa features. The best part is, these luxuries are available to you every day. They are no longer reserved for special spa days or exotic vacations. These spa-inspired bathrooms, offering personalized pampering and might we add, an escape from our busy lives — are trending. Watch for spa-like features, like body sprays, multiple shower heads, built-in benches, and more. With a zero-threshold entrance, these not only look sleek and stunning, but they also expand mobility options in the bathroom. This year will see a lot of emphasis on letting in natural light and brightening up the bathroom. Either opt for large windows or go for a skylight. A skylight offers ambient light and makes the bathroom appear roomier than it is. 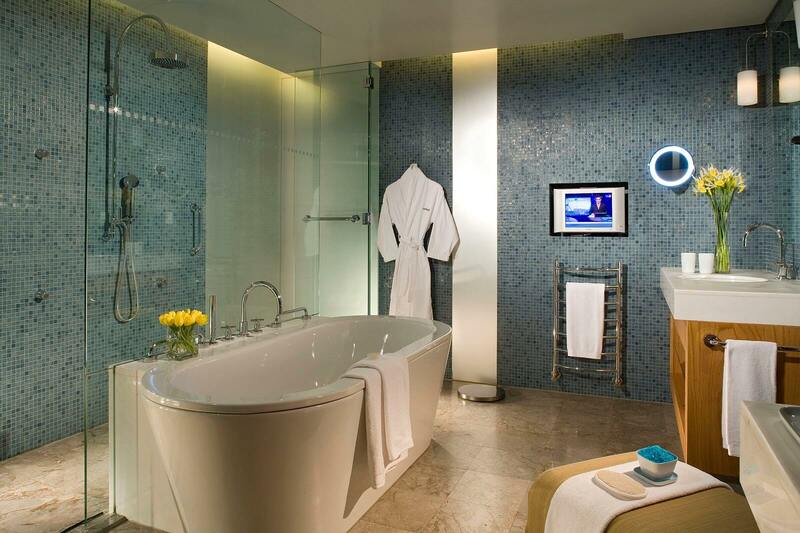 And, it can even make an awkward-shaped bathroom (in case you didn’t notice the above design) stylish and trendy. Just as you take care of your bathroom design, walls, and utility features — this year, you will have to give attention to its flooring options too. 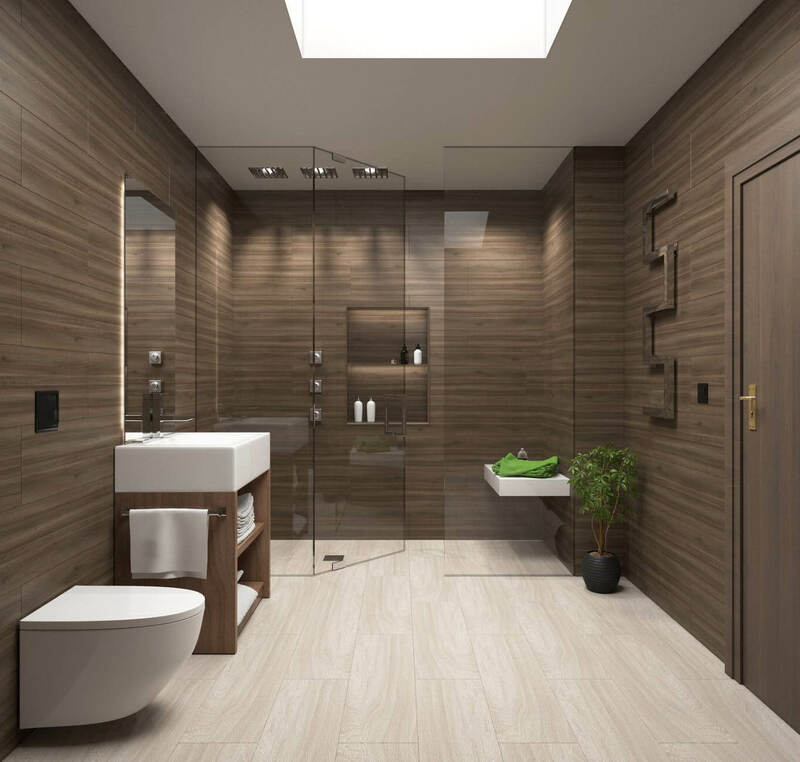 Interesting floor patterns and tiles are the norms for your bathroom remodeling in 2019. We love the eye-catching patterned marble flooring that has been carefully matched with the color tone of this bathroom. Very chic. When it comes to faucets, people are moving away from the more traditional faucets and toward styles that are sleeker, angular, and even industrial. Some materials are making their way out, while others are gearing up for their beautiful turn as the star of the bathroom. For instance, brass is back, but not the same brass you remember from decades ago. 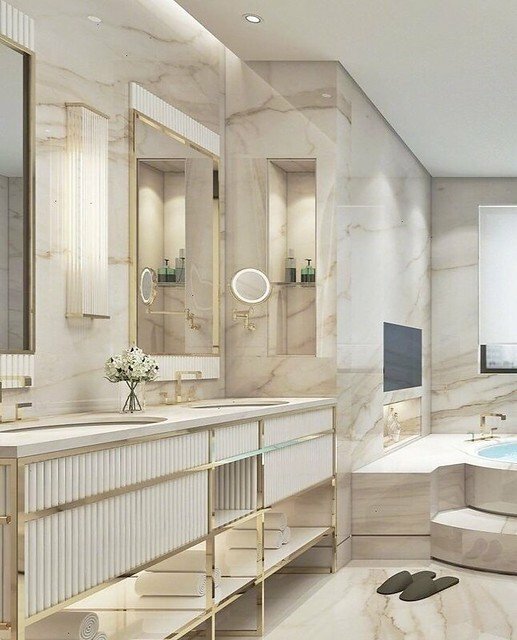 The brass of 2019 is a warm-toned gold that makes the bathroom seem homier – while remaining glamorous, elegant, and luxurious. Granite is no longer the countertop material of choice, as quartz is a beautiful, durable, and less-expensive option. This trend is also taking hold in the kitchen area. 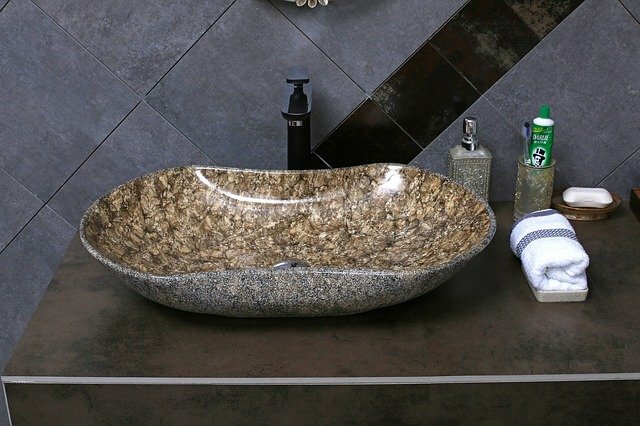 Similarly, hand-carved stone sinks are replacing traditional porcelain of yesteryear and adding a personalized, stylish statement to the bathroom. Basically, you can choose a bathroom sink that is as far away from the ordinary as possible. Because normal is boring. A good photograph or a bright artwork on canvas can easily set the tone and mood of a space. In 2019, the modern bathroom too will feature a sophisticated piece of art — a splendid creation that adds a unique touch to your bathroom. After all, this is where you start your day and perhaps wrap your head around the possibilities that it holds. So, why not show off your personal taste and instantly brighten up the area? Keep the scale large for an impactful focal point. If a bathroom reno is on the cards for you in 2019, it’s perfect timing. We have 10 bathroom trends that will make your space fresh and beautiful. This is the year to take chances on your bathroom remodeling. Mixed materials, colors, and textures are replacing the sterile, all-white look. 2019 is bringing personality and style in endless ways. Think about your choices and tastes that make you feel comfortable, and incorporate them into your home. This article was originally published on New Life Bath & Kitchen’s blog here. Hi Chuck, I really appreciate this 2018 bathroom remodeling trends you have just shared with your readers! I am trying to help my sister in renovating their bathroom that is why am collecting more ideas on how could I help her. I definitely love your tile design and in-floor heat trends, perfect! I totally agree with that idea to think beyond the subway tiles. My bathroom could use a makeover. That’s the only room in my house that’s plain. Hand-carved stone sinks are simply amazing.I love this trend.Thanks for sharing such great article.I am glad that I came across such a great article.